The Celestron RASA 8 F/2 Astrograph is a modern astrophotography telescope with an optical design that allows you to collect deep sky images using short exposure times. Based on the popular 11″ version, the 8” model is the most affordable RASA (Rowe-Ackermann Schmidt Astrograph) in Celestron’s lineup. The RASA optical system presents a modern and practical approach to extremely fast deep sky astrophotography. I like to think of it as an evolved Schmidt camera for today’s amateur astrophotographer. I should start off by saying that until now, I’ve never used an SCT (Schmidt-Cassegrain Telescope) in my life. I’ve always been a refractor guy. So my experiences with the RASA 8 F/2 will not only be a first in terms of this telescope design, but also the unique Rowe-Ackermann Schmidt Astrograph optical system. The Celestron RASA 8 F/2 is not a visual telescope, it was designed exclusively for deep sky astrophotography. The size of the RASA 8 does not allow you to use it with a DSLR camera, as the camera body will obstruct too much of the corrector plate on the front of the telescope. The 8″ Celestron Rowe-Ackermann Schmidt Astrograph. That’s right, the RASA 8 F/2 requires that you mount the camera to the telescope’s objective end. 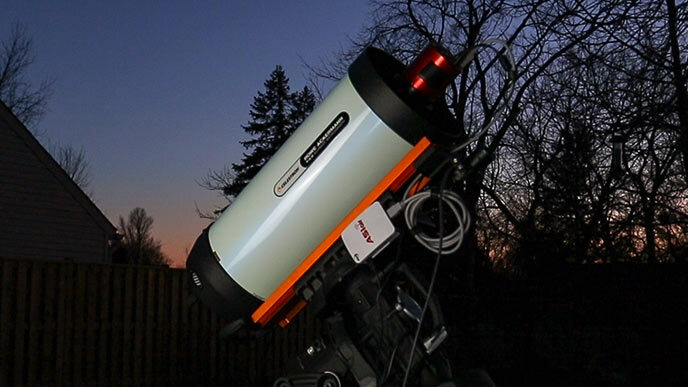 A dedicated astronomy camera with a chip no bigger than APS-C is needed to enjoy the RASA 8. 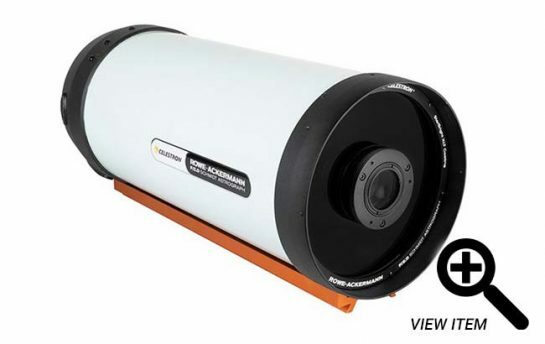 The 8” model was designed to be used with modern CCD and CMOS dedicated astronomy cameras like the ZWO ASI294MC Pro, or ASI1600MM Pro. Full frame sensor cameras that are less than 4” in diameter will work, but performance will be poor at the edges of the field. In this post, I’ll share my experiences using a telescope that is more than twice as fast (f-ratio of F/2) as any other telescope I’ve used for astrophotography. This 8-Inch Celestron Rowe-Ackermann F/2 Schmidt Astrograph was generously loaned to me from High Point Scientific for review. In this review, I’ll take the RASA out for a test drive in my backyard for some deep sky imaging. I’ll explain how to fasten a camera to this telescope to utilize the unique RASA optical system that is based on the idea of Celestron’s original Schmidt camera. I will be mounting the Celestron RASA 8 F/2 to a Celestron CGX-L computerized equatorial telescope mount, and connecting a one-shot-color astronomy camera, the ZWO ASI294MC Pro. The goal is to capture an impressive color deep sky image using short exposures (60-seconds) without the use of autoguiding. I have the Starizona filter drawer for ZWO cameras to house my 2″ light pollution and narrowband filters. This not only allows me to easily swap filters on the RASA, but also provides the right amount of spacing between the camera sensor and the objective of the telescope. The backstory of Celestron’s RASA telescope is very interesting, and begins in the 1970’s with the introduction of Celestron’s Schmidt cameras for use with 35mm photographic film. Later on, the Faster camera was introduced that was created by removing the secondary mirror from a standard C8 SCT, and replacing it with a series of lenses on the corrector plate. Originally, the SBIG PixCel 255 camera was the CCD camera used with the Fastar system. By 1999, this was replaced by the SBIG ST-237, with a whopping 640 x 480 array that covered 40 x 30 arcminutes of sky. 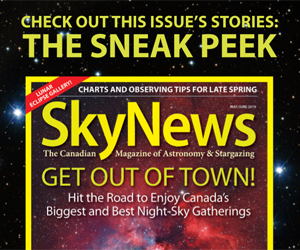 By today’s standards this is not very wide, but back then it was considered to be a rather wide-field image. Celestron eventually discontinued Faster, and the idea was taken over by Starizona in the form of HyperStar. This product could now expose an impressive 27mm image circle, which was enough for the APS-C sized sensors found in a DSLR camera. Starizona provides conversion kits and camera adapters for many Celestron SCT telescopes from the C6 to the C14. 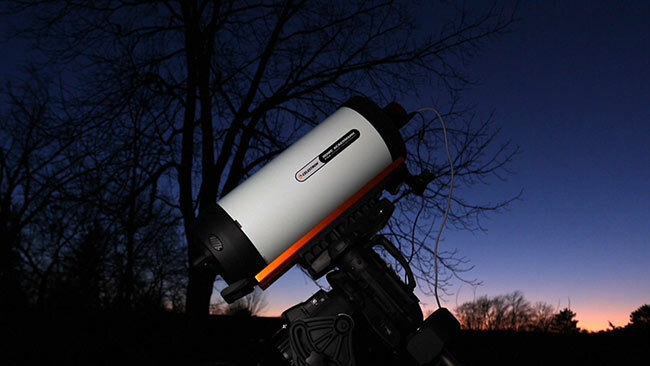 The Hyperstar system allowed amateur astrophotography enthusiasts to capture deep sky images in a short period of time thanks to the lightning fast F/2 optics. 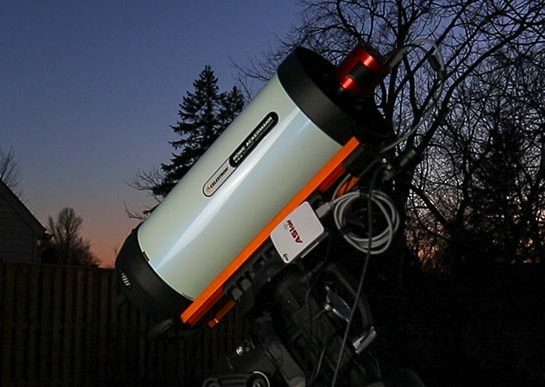 Hyperstar paved the way for the RASA design as this add-on component introduced fast, short-exposure, wide-field imaging to the amateur astronomy world. 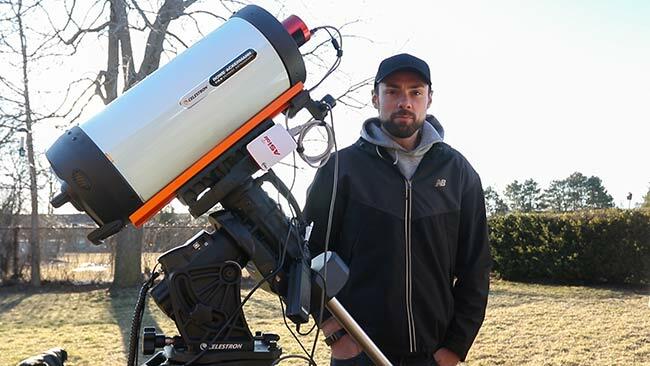 Thanks to David Rowe and Mark Ackermann, the amateur astrophotography community can enjoy the unique capabilities of the original Celestron Schmidt camera design in a practical astrograph. The optical design of the RASA OTA. You can read the full story of the how the RASA was developed by reading the white paper from Celestron. It is an interesting read, not only from the perspective of the unique optical design of the RASA, but how optical designs affect astrophotography in general. As you may know, I have used apochromatic refractor telescopes over the past 8 years for deep sky astrophotography. I love that they are compact, lightweight, and capable of capturing incredibly sharp, flat, and well corrected images. 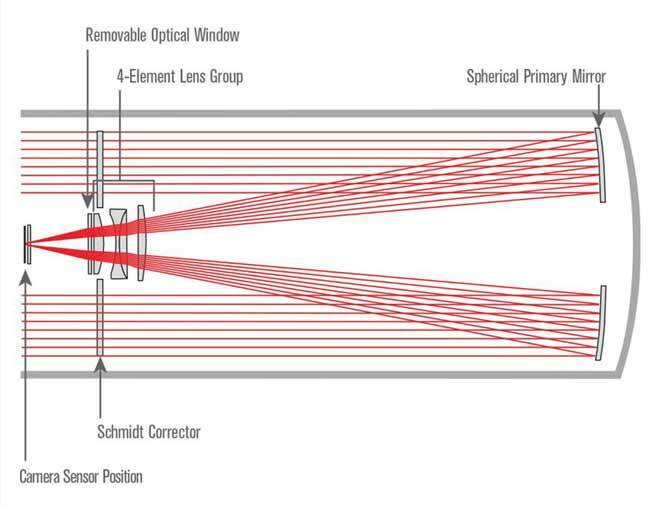 One of the few downsides of this optical design is the f-ratio (focal ratio), which is considered “slow” when compared to systems such as an F/3.9 Newtonian or F/2 RASA. The telescope’s focal ratio determines its ability to collect light in a given amount of time. This means that a “faster” f-ratio” of F/2 can gather light (signal) on a deep sky object much faster than a refractor telescope with a focal ratio of F/6. Mathematically, this speed is not linear, meaning that F/2 is not just 2X as fast F/4 – it’s MUCH faster than that! (I am not sure of the exact calculation). The point is, the 8” RASA I have is the fastest telescope I’ve ever used for astrophotography, by a landslide. Nothing else even comes close. In practical terms, I can expect to collect the same amount of signal in a 60-second exposure with the RASA 8 as I would in a 3 to 4-minute exposure using an F/7 refractor. I can do this without sacrificing a wide, flat field of view. The 400mm focal length of the RASA 8 F/2 provides a wide, optical aberration free image. At this focal length and proposed exposure times, tasks such as autoguiding become less important. A 60-second image is not nearly long enough to reveal subtle inaccuracies in the telescope mounts tracking abilities, especially when using a mount such as the Celestron CGX-L equipped with a QHY Polemaster. On my first night out with the RASA 8, I photographed two (relatively small) deep sky targets. The focal length of the RASA (400mm) is better suited for expansive nebulae such as the Lagoon Nebula and North America Nebula, but those targets do not rise high enough in the sky for imaging for another month or two. My selected targets for testing the RASA were Thor’s Helmet, an emission nebula in the constellation Canis Major, and the Pinwheel Galaxy, a face-on spiral galaxy in Ursa Major. The moon was about 75% illuminated during my imaging session. 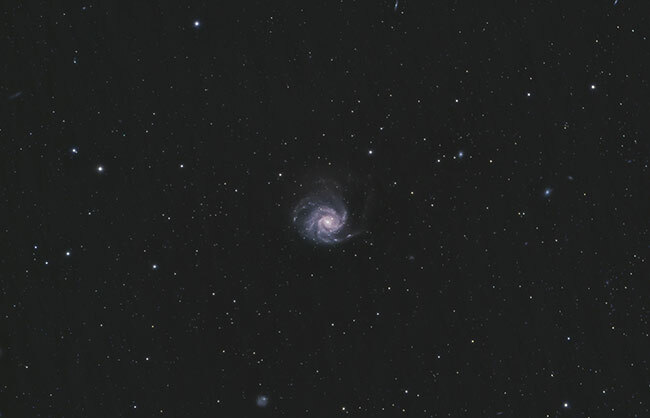 I also managed t capture the Sunflower Galaxy in Canes Venatici using the 8″ RASA. The following photo includes 120 x 60-second exposures using the ZWO ASI294MC Pro, with the Optolong L-Pro filter in front of the sensor. 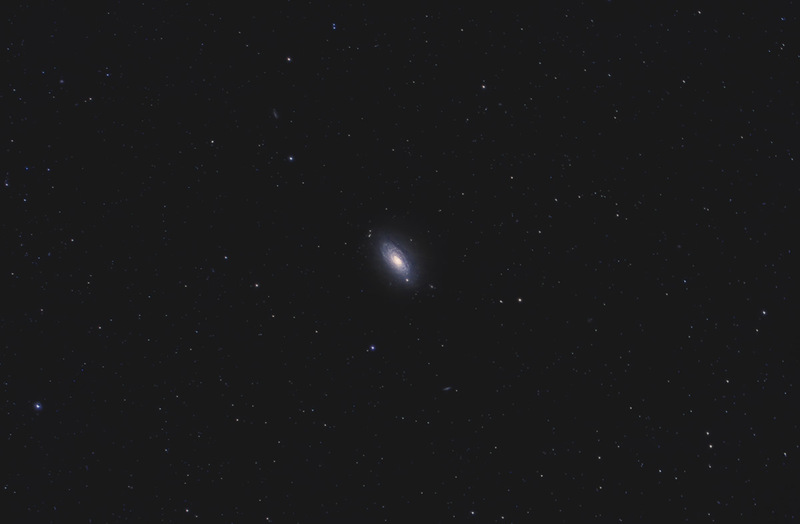 Small galaxies aren’t the wide field RASA’s strong point, but hey, it’s galaxy season. The Sunflower Galaxy. 120 x 60-seconds using the 8″ RASA. Mounting my astrophotography camera to the front of the telescope was a bizarre experience. Those of you that have experienced the HyperStar system with an SCT in the past will find this to be a familiar experience, but it was brand new to me. The Celestron M42 adapter and compression ring made it very easy to mount my ASI294MC Pro camera and Starizona filter drawer. This configuration provides the recommended 29mm of back focus spacing between the camera sensor the connection to the corrector plate on the RASA. Starizona designed this filter drawer to cater to RASA owners looking for a solution to changing filters. You simply need to remove the compression ring from the corrector, release the adapter, and pull the filter drawer out to swap your 2” filter out. This came in very handy as I went from photographing a narrowband emission nebula to a broadband galaxy on the same night. The RASA OTA package also includes a C-Thread camera adapter, and adapters for other camera types (including Sony mirrorless cameras) are available. 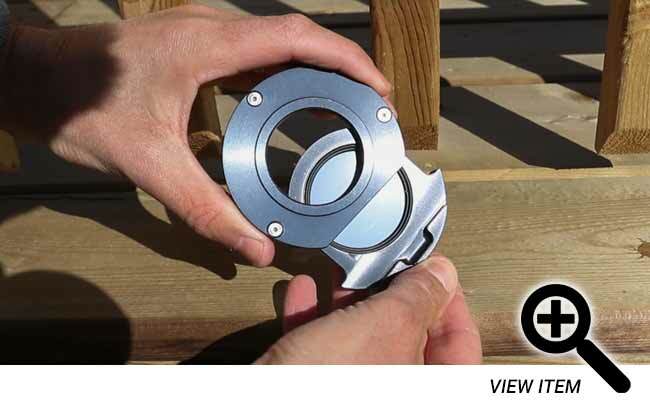 The Starizona Filter Slider for select ZWO cameras. When deciding on a camera for the 8″ RASA, there are a few things to keep in mind. The first is the sensor size of the camera you plan to use with this telescope. The optical design is optimized for use with sensors that have a diagonal size up to 22mm. It is possible to use larger sensors with the 8″ RASA, but field illumination at the corners of your image will be reduced. The pixel size of your camera is also important, but luckily the RASA works effectively with a wide range of sensors. It is well suited for cameras housing smaller pixels thanks to it’s fast f-ratio and short focal length. For example the ZWO ASI294MC Pro has a pixel size of 4.63µm, and I was very happy with the pixel scale of my images when viewed at 100%. The backfocus distance (spacing) needed for the 8″ RASA. Because the camera you choose will be mounted in front of the optics, it is wise to choose a camera body that blocks as little of the aperture as possible. The most suitable cameras for the RASA will have a cylindrical design with an outer diameter of less than 100mm. The backfocus distance needed for this flat-field astrograph is 29mm from the top surface of the lens group cell. Apart from having bodies that obstruct too much of the aperture, DSLR cameras have a long backfocus distance as the sensor is deeply recessed in the camera body. 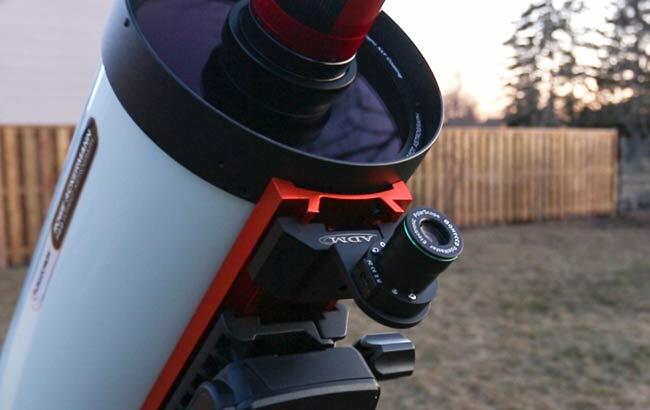 I have mounted the 8-inch RASA to a Celestron CGX-L computerized telescope mount using the CGE dovetail rail on the telescope. This heavy-duty EQ mount has a payload capacity of 75 pounds, so it is completely overpowered (or over-mounted) for the lightweight (17 pound) 8-inch RASA tube. 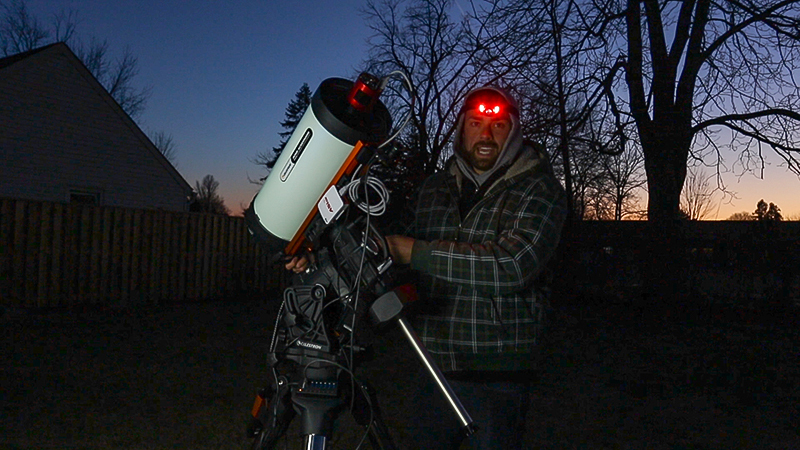 Over-mounting is never a bad thing, and the RASA looked absolutely great in an “All-Celestron” black and orange setup. It’s easy to single out one particular piece of your gear to hold responsible for a successful imaging session, whether it’s the telescope, mount, or camera. In reality, it is the combination of everything working together in harmony, from the filter used to target selection. The Celestron 8-inch RASA F/2 mounted to a Celestron CGX-L EQ mount. The Celestron CGX-L has been an absolute pleasure to use since I first flipped the switch on. This should come as no surprise as this is a modern “flagship” telescope mount from one of the oldest telescope companies in the world. From the moment I slewed to my first target using the 8-inch RASA on the CGX-L, I knew I was working with an imaging system that was going to be a lot of fun. Thor’s helmet appeared prominently in the center of the image frame in a 6-second live loop exposure. To showcase the extremely fast F/2 optics of the RASA, I restricted the exposure time of my individual light frames to 60-seconds. The nebula and galaxy targets I have chosen were well-exposed at this exposure length, and I processed data sets of 60-seconds images to create an impressive final image. The 1-minute long exposures showed a lot of promise as I reviewed the auto-stretched debayed previews appearing on the ASIair mobile app. Without providing the exact math behind the equation (which I am unable to calculate), I am capturing more than 3X as much signal (light) in each shot using the F/2 RASA over my F/7 apochromatic refractor. The images were loaded into DeepSkyStacker for integration and calibration (I only used dark frames), to give me an image with a healthy sign-to-noise ratio for final processing in Photoshop. I did not use any sort of autoguiding system for improved tracking accuracy on the Celestron CGX-L. However, I did capitalize on the precise alignment provided by the QHY PoleMaster before I started taking images. The process involved using a specialized ADM adapter that fastened to the CGE dovetail rail of the RASA 8. The PoleMaster sat directly underneath the OTA, which positions it precisely in line with the RA axis of the telescope mount. I ran through the PoleMaster alignment routine on my PC for an accurate polar alignment before beginning my imaging session. The QHY PoleMaster fastened to the CGE dovetail rail of the RASA. At this focal length and these exposure times, autoguiding is not necessary. The telescope and camera were well balanced in both axis of the mount, and the spot-on polar alignment took care of the rest. I still can’t get over the fact that I can get away with a 1-star alignment now that the PoleMaster has been installed. If you’re looking to autoguide with the RASA 8 F/2, it’s important to note that the optical tube does not include a guide scope. However, it can be fitted with a bracket for this configuration thanks to the threaded mounting holes at the rear cell of the astrograph. What can I say, the ZWO ASIair makes it so much more enjoyable to run an imaging session. The wireless connection to the camera and straightforward controls of the mobile app let me do other things while the camera runs (like go in the house). The software is stable and I can confidently record my images onto the micro USB card on the ASIair and transfer them over to my PC the next morning. I have found that the ASIair mobile app cools the camera to -30C much faster than Astro Photography Tool. The debayered image previews the ASIair displays after each image is captured are a helpful reference of camera settings, tracking accuracy and image framing. I still prefer to use APT for my initial camera setup including focus and framing, but that’s because it’s already there to complete my polar alignment routine. However, once those tasks are complete I can put my PC away and just keep my tablet on me to monitor the ASIair. From a cable management perspective, the ASIair is much more organized as the USB cable running from the camera connects to unit less than 2” away, and rides along with the telescope and mount. Controlling the camera using the ZWO ASIair WiFi device and mobile app. 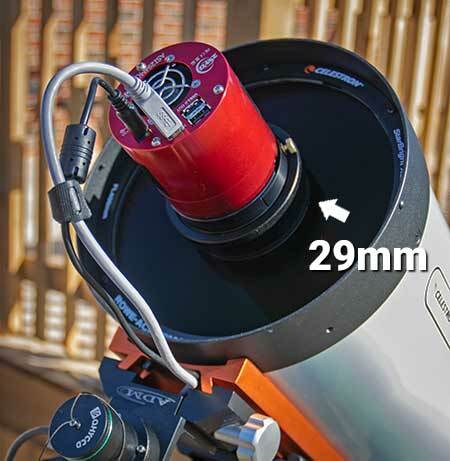 The 8” RASA includes a connection for a cooling fan and power adapter at the base of the telescope. The cooling fan helps to reach thermal equilibrium with the outside air by pulling air through the mesh vents located near the rear of the telescope. The greater the temperature difference is between the OTA and the outside air, the longer it will take to cool down. It is recommended to use a dew shield with the RASA as the corrector plates are quite susceptible to dew accumulation. I don’t have a dew shield for this telescope yet, but it would be a wise addition for those nights where the temperature drops significantly. The focuser is unlike anything I’ve ever used before, and I really love it. Celestron calls it the “Ultra-Stable Focus System“, which minimized unwanted lateral movement of the primary mirror when focusing or slewing the telescope. To focus the RASA, you just need to turn the little knob at the rear of the tube, that moves the entire primary mirror forward and backward. As you can imagine, focusing at F2 is tricky. The focuser knob is smooth and responsive, without the need to lock anything down once you have found a tight focus on your stars. A single turn of the focus knob does not move the primary mirror much. This gives you a lot of precision when achieving the sharpest focus possible. 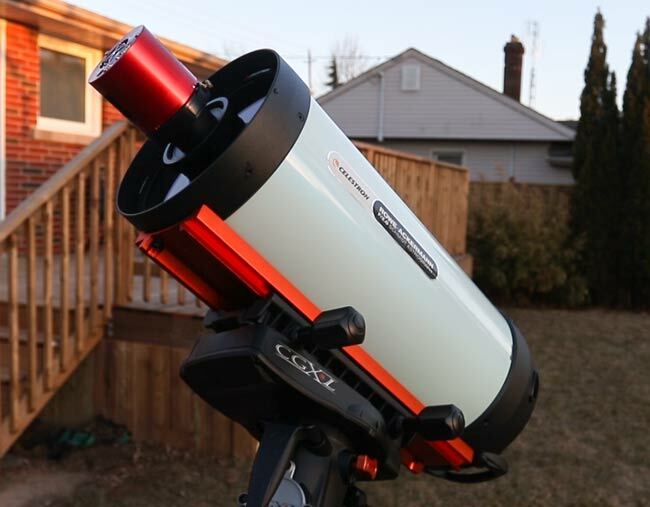 Celestron offers an optional focus motor specifically designed for this telescope, which is a probably a smart upgrade if you are getting serious about focus. I found the stock focuser to work great so far. The images below are the results of my limited exposure times using the RASA 8 and ASI294MC Pro from the city. To give you an idea of the amount of light pollution I shoot in, my skies are considered to be a Class 6 on the Bortle Scale (orange zone). I am thrilled with my results. It felt like I was processing images that were captured using 5-minute exposures using a DSLR camera on my refractors. The Pinwheel Galaxy – 72 x 60-seconds. Thor’s Helmet – 138 x 60-seconds. The unique camera configuration of the RASA had me a little confused about how to take flat frames with this telescope. My tried-and-true “white tee-shirt method” would not work for this setup because the camera protrudes past the objective of the telescope. Luckily, a member of the Cloudy Nights forum ran into this very same issue, and shared the results of his experiment and potential solution. 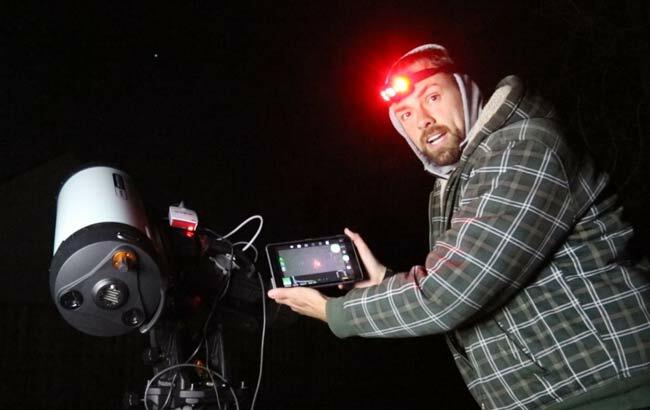 He created what he calls “night flats”, that use the glow of city light pollution to achieve a useful ADU value (brightness level) for a flat calibration frame. The idea is to create a cardboard flat frame “cap” with a parchment paper insert to place on your dew shield. This diffuses the light of the night sky enough to create an evenly illuminated field. Since my backyard night sky glows with surrounding light pollution (Bortle Class 6), an exposure of about 10-15 seconds will collect enough light to create a useful flat frame. 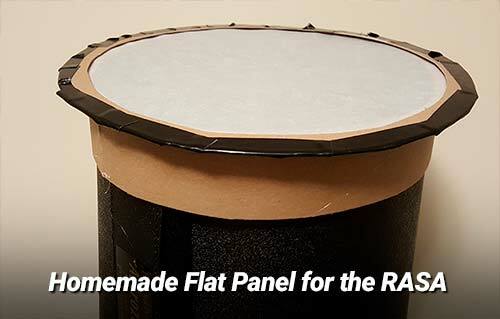 A homemade flat panel for “night flats” by Cloudy Nights user APshooter. The Celestron RASA 8 is suitable for those that want an ultra-fast astrograph with a wide, flat field of view. 400mm at a blazing fast F/2 is an amazing combination of speed and focal length. If your into wide, flat field images of large deep sky objects, these are useful specs. If you’re going after small galaxies, a traditional SCT or Ritchey-Chrétien Telescope are better choices, but your exposure times will need to be a lot longer, and autoguiding is a must. I’ve used a ton of refractors and camera lenses at this focal length, but nothing that comes close to F/2. For comparison, one of my favorite APO refractors, the Sky-Watcher Esprit 100 is 550mm and F/5.5. At F/2, 60-second exposures reveal as much detail as I’d expect to see in a 3-minute exposure or longer. A telescope’s focal ratio is the most important factor to consider when gauging its light gathering ability. Between the one-shot-color camera, and the amount of detail recorded in a 60-second exposure, you can really maximize your output in a limited amount of time. I’d love to see what the RASA can do when the Milky Way returns next month. The simplicity of having one camera running, controlled by the wireless ASIair is a lot of fun. Being able to produce an impressive deep sky image using 1-minute exposures is something I could get used to, especially on those nights when I only get a clear hour or two. If you image with a DSLR, or want to make visual observations, the RASA 8 F/2 isn’t for you. The size of the camera and sensor have to be a good match for the RASA to keep the central obstruction to under 93mm, and capture a well illuminated field. A filter drawer/adapter that provides the correct spacing between your camera and the optical window cell is an essential accessory in my opinion, so make sure you’ve got that aspect covered. Now, if you’ll excuse me I’m going to collect more time on the Pinwheel Galaxy. Until next time, clear skies.